Some days you find you have the luxury of time and energy to cook something complex and adventurous to eat – but for those Other days you need a few “go-to” meals that you know will be tasty that you can easily prepare. 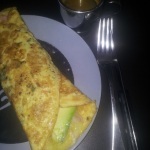 Breakfast is especially a challenge for me because I start my day slowly and build momentum over several hours – luckily I discovered early on that I could, with a little practice, cook up this Lo-Carb Breakfast omelette (almost) every time that was always delicious. 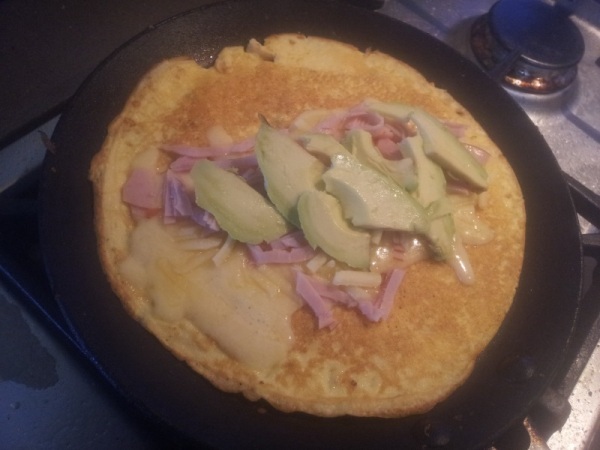 This is essentially a Royal Omelette containing Avocado, Ham and Cheddar. The best pan to cook this in will be the one you feel most comfortable using. For many years I used a thin crepe pan, but lately I have been using heavier cast iron skillets and using the residual heat of the pan to finish the cooking with the result that I burn the meal far less often. I am usually cooking this before my first espresso of the day, so that is a good thing. 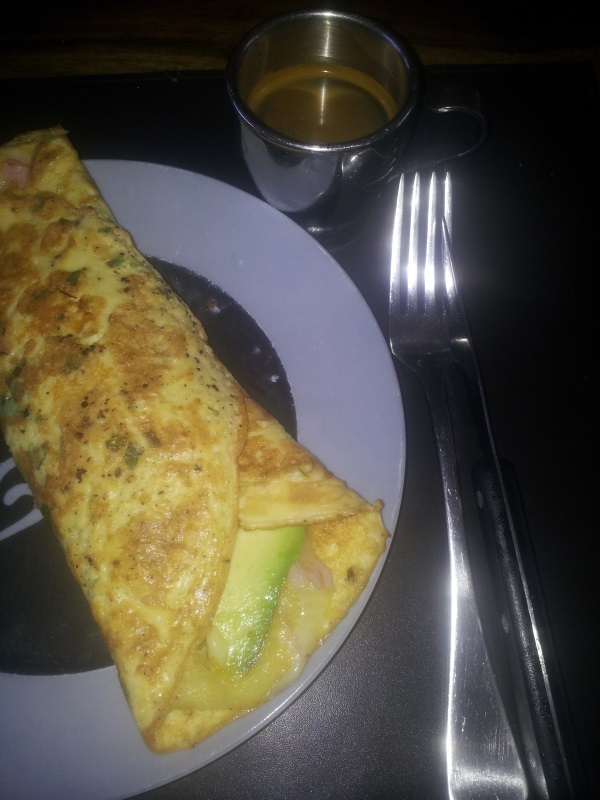 For the 180 days that I have so far been LCHF, this (or a simple Bulletproof Coffee) was my breakfast for over 170 of them, and I am still not bored by it. That might give you an idea of just how luxurious this meal really is. 1 egg white You can also just use 2 whole eggs if you like it very yolky. 1 tbs Heavy cream This is what makes an omelette, Royal. Wash out an empty jar (I use an old vegemite jar, but a peanut paste is about the right size). Put a skillet onto a burner to start getting the pan hot. You can put a little bacon fat/lard in the pan because eggs cooked in a little pork fat tastes awesome. Crack your egg(s) and/or whites into the jar. Add the Heavy Cream. Use a pair of kitchen scissors to quickly cut up the parsley and chives into the jar, then screw the lid on and shake the jar until the cream is well mixed into the eggs. Pour the mix into the hot skillet and turn the skillet slowly allowing the liquid egg to fully set. This top side will be the eventual outside of the omelet, so season with salt (which will also encourage the egg to set). Once the egg has set, run a flipper utensil around the outside of the omelette so it breaks its adhesion to the skillet. Flip the omelette in the pan and turn off the heat letting the momentum of the pan finishing the cooking. 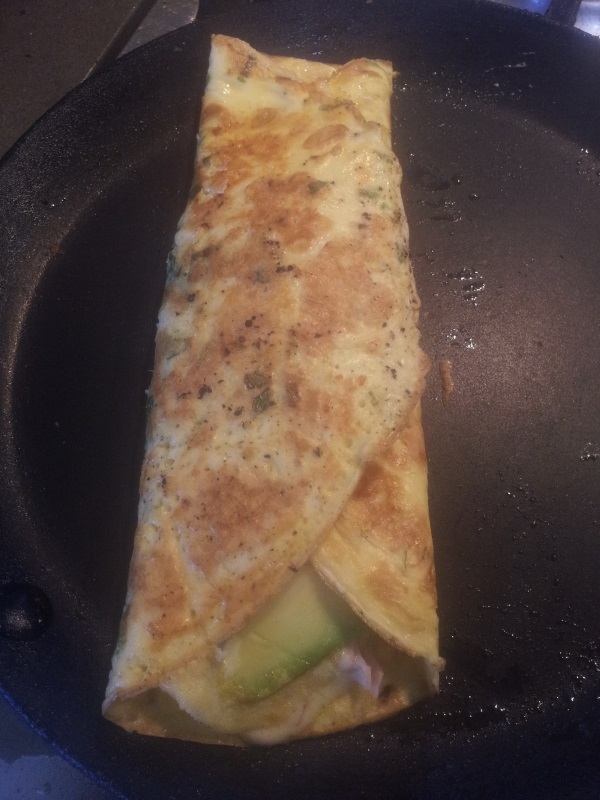 Fold the edges of the omelette over the contents and smear a little butter on the outside of the omelette which will melt and make the dish glossy and moist.